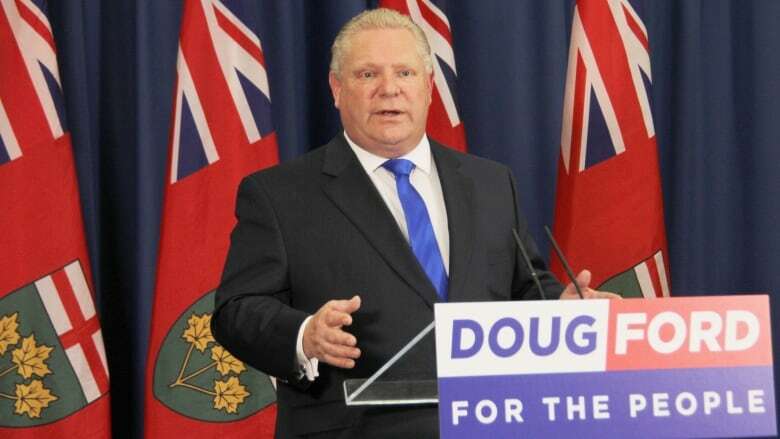 Ontario Progressive Conservative Leader Doug Ford said he will cut hydro bills by 12 per cent, if elected. Ford announced those plans Friday morning while visiting Kitchener. The plan includes a moratorium on new energy projects, returning hydro dividends to customers and moving the costs of conservation programs off hydro bills. He said those measures would save the average Ontario family $173 each year on their hydro bills. If elected, reductions are scheduled to begin by Jan. 1, 2019. "After 15 years of letting Ontario hydro rates triple — imagine that, triple — the Liberals saw an election coming. They panicked, they got desperate. They cooked up the so-called Fair Hydro Plan, and they paid it by hiding billions of dollars of your money," Ford said during his stop. Ford also said his party would stop the practice of "hiding" conservation program price tags on hydro bills. Ford did not say he would kill the Liberal's Fair Hydro Plan. Cambridge MPP and Transportation Minister Kathryn McGarry said she's concerned by Ford's pledge to cancel future energy projects. "These are long-term energy contracts that are bringing clean air and energy into our grid," McGarry told CBC News, noting there would be a cost to cancelling any contracts already in place. "We as a province have moved forward and rebuilt a system that is the envy of the world right now because we are emissions free, and we've cleaned up our air. We are saving $4 billion a year in healthcare costs because we are no longer burning coal," she said. "What Doug Ford is talking about ... we're already doing in removing some of the costs off of the rate-payers and onto the tax base such as the Ontario energy support system." Colin Nekolaichuk, a spokesperson for Minister of Energy Glenn Thibeault, said Ford's announcement shows his "intention to embrace" the Liberal's Fair Hydro Plan. "It's everything else that Doug Ford has proposed that fails to pass the smell test," he said. "By bragging loud and large that he'll tear up committed capacity contracts, he is inviting massive lawsuits that will surely be won, costing the provinces hundreds of millions of dollars that, in turn, will drive electricity bills back up." NDP Leader Andrea Horwath said Ford's announcement shows he "stands proudly for a privatized hydro system" and said her party's plan would reduce hydro bills by 30 per cent. "Mr. Ford has endorsed the Liberals' disastrous hydro borrowing scheme, which will cause bills to skyrocket by 70 per cent right after the election and add $40 billion of debt for future generations to pay off," Horwath said in a statement. "This after repeatedly criticizing the Liberal scheme, and the high executive salaries that come along with it."